My preference is for a simple kombu based stock, which can be made quite easily by soaking a piece of good quality kombu in water in a closed container overnight in the fridge, as shown in the photo. (See this post for more about kombu.) 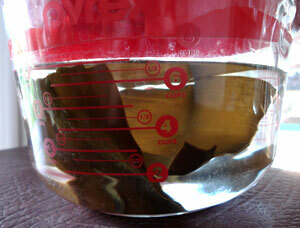 I put about a 30cm / 12 inch long piece of kombu in about 2 litres (8 cups) of filtered water. This is more kombu than for the regular kombu and katsuobushi stock, since the kombu has to produce all the umami on its own. If you don't have time to soak it overnight, you can soak it for a minimum of half an hour at room temperature. To use, bring the dashi up to a simmer (not a full boil), then take out the kombu. This produces a light colored, subtly flavored dashi. The soaked kombu can be cooked further until soft, and used in stewed dishes and the like. If the kombu dashi is too subtle for you, you can try tossing in a couple of good quality dried (never fresh) shiitake mushrooms in the water. This needs to be soaked for at least a couple of hours, or until the shiitake are quite soft. This will produce a light brown colored dashi with an assertive shiitake flavor, which is especially suitable for dishes that will include the shiitake. The soaked shiitake can be used in your dish. If you cook whole dried soybeans, the cooking liquid is full of umami and makes an interesting rich vegan stock. Use on its own or in combination with one of the other stocks. Submitted by maki on 2007-05-17 13:11. It's certainly not a traditional ingredient, but Hiromi and I much prefer vegetarian dashijiru made with dried porcini mushrooms rather than dried shiitake. Hiromi likes it because it tastes more like katsuo-dashi than the shiitake version, and I like it because it's more complex and aromatic. It's made the same way as konbu-shiitake-dashi. Depending on the desired intensity you can adjust the amount of porcini. I discovered the substitution when I was smelling dried porcini before using them for a non-Japanese dish, and it reminded me so much of the smell of katsuo-bushi. Thanks for this -- it was on my mind a few months ago when I was thinking about a potential vegan menu for a friend, and was frustrated when it occurred to me that dashi is as you point out not even vegetarian much less vegan. But in retrospect these alternatives make perfect sense and are rather obvious choices. Cheers! Hey mate, very cool meals. My wife maked this for me today. Thank you very much that you thought about this point too. 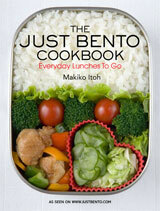 Many people forget to mention bonito let alone mention a way of preparing vegan dashi. That's because bonito is fish. It just doesn't look like itby the time you buy it. a new vegan thanks you!! didn't want to have to give up miso soup. can't wait to try all your great ideas. Just wanted to drop you a note and let you know I used your veggie dashi stock recipe for a dumpling soup I made today. It was so simple and the soup was divine. Fortunately, I live in NYC and have access to almost everything in terms of food and/or ingredients. After perusing your site, I am anxious to try more of your recipes. Thanks again. Oh, and Happy New Year. Cool! Quick question...Could you substitute a good quality fish stock for dashi stock? I only ask because my friend lives in a little town in Texas and cannot find the ingredients to make the dashi stock. If fish stock would not work… any suggestions? Any good stock will work, because stock is adding umami. What makes it more Japanese, or French, or whatever in flavor are the vegetables you add to it...so for a Japanese dish she may want to stay away from distinctly Western tasting veg like celery in the stock. It won't be the same as a dashi made with kombu etc. but it should be tasty! The fish should of course be very fresh etc. Can anybody point me to a retailer name for tororo-konbu, can find reference to it on websites but nothin in the way of someone to order it from. You don't say where in the world you are, but just guessing from the Ta part you might be in the UK, Japan Centre carries it. Otherwise, any decent Japanese grocery would have it - it's a very common ingredient in Japan. Fixing an overpowering dashi stock, aka what did I do wrong? So I'm trying my hand at Japanese food for the first time as a budding self-taught cook, thanks in great part to blogs like yours. However, my first dashi was overpowering in a way that was extremely offputting, and even a regular tofu/wakame/green onion miso soup, which should be comforting and subtle, tasted like the sour-smelling dashi no matter how much miso paste I added. What I think I did wrong was a) used kombu, katsuo-bushi AND about 3 dried shiitake mushrooms (although all ingredients are fresh) in the broth, b) let it sit for like 2 and a half days in the fridge without straining it, and c) didn't use filtered water. Can you ever use all three ingredients together? Should I just use kombu to make dashi since it's a little subtler, at least until my taste buds adjust to the umami? I think that while it was sitting in the fridge, it somehow started to ferment. (It could be that your refrigerator is a bit warm). Next time, try straining it after a day or after soaking overnight. Dashi should not taste sour at all - just full of umami. Hope that helps! Can i substitue arame or wakame for the kombu, since i cant seem to find it where i live. I wouldn't, I don't think they will give the same flavors kombu does. If you have some asian markets they will probably have it but it may just be labelled "sea weed" (doesn't help I know). If the asian market where you live is anything like the one where I do they don't speak alot of english and might not speak much japanese either, thus ask them for haidai. I have been looking at a recipe on youtube for Nikujaga...the woman says to use 1/2 tsp of granulated seaweed dashi.dissolved in 1 cup of water..I can't seem to find this on the internet....is there such a thing as "Granulated seaweed dashi"? the website on youtube was "Cooking with Dog" and the recipe is for Nikujaga if you want to look at it. You may be able to find seaweed dashi powder (konbu dashi) at a well stocked Japanese grocery store (outside of Japan that is; in Japan it's a standard item, but not really outside. That Cooking With Dog series doesn't account for ingredient availability at all from what I've seen of it) It it's not as widely available as regular dashi granules (called hondashi and so on) which is made from both seaweed and dried fish. This you can find in any Japanese or Korean grocery store, and in many general Asian stores too. You can substitute one for the other. Since nikujaga has meat in it I'm assuming you're not a vegetarian and have no objection to the fish in regular dashi powder. Otherwise, you can try my nikujaga recipe (or the vegan variation, which use made-from-scratch dashi stock, which is far better than the granules. Thank you! I am just going to make my own dashi out of Kombu..none of the local stores have the powdered form, but they have the dried Kombu...I will also try your recipe as well...I'll let you know how it comes out. Thank you again. is it okay to soak the kombu more than a day? I was attempting to make a vegetarian miso soup. I'm a recent convert, and I've only ever eaten the non-veggie kind. My dashi came out tasting over-poweringly salty and sea-weedy, and not at all like what I'm used to. Did I do something wrong? It's hard to say what you did wrong unless you tell us what you used. I used the amount of Kombu (I don't know what kind - it was labeled "Dashi Kombu," which is not very specific) your recipe called for, two dried shitake mushrooms, and the eight cups of filtered water. I soaked it over night in the fridge and simmered it as the recipe calls for. I'm guessing that the culprit was the 'dashi konbu' - natural konbu seaweed should not be salty at all, since it has no salt on it. Are you sure you got dashi konbu, and not konbu-cha (salted, cooked and dried slices of konbu seaweed that's soaked in boiling water and drunk as a tea...not the same thing as kombucha, the weird bottled drink?) Taste the 'dashi konbu' you used, and if it's salty (and it's soft, rather than dried), you definitely got the wrong kind. once simmered, how long will the stock be good for. Just realized I don't need 8 cups! Will it be good for a week in the fridge? Is there anything that I could use to substitute for kombu, yet still get the same taste (somewhat)? I can't seem to find kombu seaweed anywhere around here. I really enjoy reading your site! Thanks for all of the useful things you share. Boiling ingredients to make any kind of stock is fine, except that it tends to make the resulting liquid cloudy since the hard boiling action releases a lot of scum from the ingredients into the liquid. When you soak or gently simmer things, the flavors are drawn out gently, and you can skim off any scum that does come out easily. When you soak things barely any scum comes out. Japanese cooking often calls for clear stock (e.g. clear soups) so the clearness of the stock is important. It's also considered important in say, making ramen soup. HTH! Hi, thanks for all the goodness! i have been using your site like crazy lately. 1) How long can you store the kombu dashi for after you prepare it? 2)How long can I save the 'used' kombu for? Like just now I made a small portion of dashi for some miso soup, and had this lovely piece of kombu I had no intention of using tonight. Can I store it in my fridge as is? For how long? I am going to make a Kombu and Shiitake dashi. And I was wondering if afterward I could fry the kombu and the mushrooms and grind them to a powder for making instant dashi without the additives. If so how long could I keep it before it would go off? it mentions that kombu can be made into a condiment. first of all, this is really a great job what you are doing on your blog! 1. Should kombu be soaked first and then shiitake added after it's soaked, or I should soak kombu with shiitake? 2. If shiitake should be added later, should it be soaked in clean water and the result put in kombu stock, or it should be soaked directly in kombu stock? Sorry for the stupid question, but I'm a bit new to this. How wide are your 12in kombo pieces? Does the length even matter that much? I've seen recipes that use 8in per 2 liters of water, and others that use several 6in strips for the same amount (although these were boiled without soaking). Quick questions: How do you properly store preused kombu? How long can you store this preused kombu or does it need to be made immediately after the first use? Hi Thanks for all these useful tips - just what i was looking for! A silly question: After simmering the Kombu dashi, do you just keep it in the fridge? for how long? how do you know it didn't go bad? Thanks again, love your blog! (and Japan, and Japanese food in general)! Leftover dashi will keep in the refrigerator for a few days, or you can freeze it too (after straining). If it starts to smell funny then it's gone bad. Thanks for the vegetarian Kombu stock recipe! I tried the vegan dashi recipe, one big kombu strip + eight shiitake mushroom, soaking overnight in 2 liters of water. Next morning, I tasted it and it was bland! It did have a shiitake flavor but not enough to be tasty. I'm new here, searching for vegan version of dashi. I found so many interesting options here but I'm wandering one thing - can you use a dry kelp powder instead of dry Kombu to make a dashi? Do you have a suggestion or maybe a recipe? I have kelp powder and kelp granules -- way more than I could ever use -- and I plan to make dashi with both. What I will do is cook it in the water and then after the water has cooled I will blend in a blender on a high speed -- and then strain through a fine mesh bag (such as a nutmilk bag). Have you ever had snails and bug appear in your kombu stock. They're not alive, obviously, but I assume that they were missed before the drying process. I found a few shells floating at the top of my broth this morning. I have never, ever encountered floating shells from konbu in my life. Ever. You got a bad improperly cleaned batch. Where was it from? Hello Maki. I feel stupid asking, and their are similar questions asked, but how would you make it stronger? I used a large peice of dashi konbu and some dried shitaki mushrooms and let it sit for a day. Once I made the soup and all of that it was rather bland. I suppose maybe the paste wasn't strong enough, and I used a lot. What would you say I do to make it stronger? Yay! I've recently been want to try Japanese cooking, but I'm wary of regular dashi due to seafood sensitivities. I've never gotten sick from anything I've tried in a restaurant, but I'd rather be safe then sorry when making it myself. I'm definitely going to use some of these substitutes! very excellent recipes for vegan dash.. thank you! I have skipped a lot of dishes which used non-vegetarian stocks in it. I was badly waiting to get a recipe to prepare vegan stock. Finally I got it from here. I would love to try this recipe for vegan stock. Thank you so much. Additionally, Eden Foods Mirin is gluten-free and regularly tested. If you have any pesky gluten-free vegans that want a nice bowl of buckwheat udon- there ya go.